Have you ever been to Israel? If not, you’re really missing out on the plethora of great Israeli food you will try there. Think mounds of creamy hummus, topped with newly pressed olive oil and chickpeas; freshly chopped tabbouleh bursting with the aroma of mint; piping hot crispy falafel made right before your eyes. It’s a foodie’s dream come true to eat in Israel. If you’re wondering where you should travel for food in Israel, don’t limit your thinking to Jerusalem and Tel Aviv. There are fantastic food opportunities all over the country. One of my favorite places to get to know Israel and it’s food is in Haifa, a city in the northwestern part of the country. In Haifa, you can take a private guided food tour with Haifa Street Food Tours, who will make sure you don’t leave without a full understanding of the food of Israel, and what makes Haifa a special food destination. The best part of this tour is that you get a chance to visit some of the best Haifa restaurants, where the chef is a local fixture who’s been perfecting his craft and serving the people of Haifa for many years. I love food tours in large part because of the opportunity to meet local purveyors and get a real insight into why they run their business and the passion behind it. We certainly came across that on our walking tour of Haifa, Israel, restaurants. Our tour guide, Jessica Halfin, did a fantastic job setting up the stops and preparing us with great information about the restaurant, the food, the city and the culture of Haifa, as we went along. Mind you, there were over 10 different stops with more food than I could wrap my mind around, but a few traditional dishes stood out for me. One of my favorite stops was at Borekas Bachar HaAgala, an unassuming pastry shop in the center of town. The shop is nothing special to look at, but the display case at the front is full of a local specialty, called borekas: a flaky pastry stuffed with all kinds of different fillings, from spinach and goat’s cheese, to mushrooms, to a salty cheese that made my mouth water for more. Borekas is the specialty of this shop, and an Israeli classic. They are popular both as a breakfast pastry and as a street food snack. The crunchy, buttery pastry is very filling and satisfying – perfect food for a hangover cure, if you ask me. Here is a recipe for Jewish Borekas, if you want to attempt to make them at home. You can use store-bought phyllo dough to make it easy! You can’t visit Israel without consuming mass quantities of hummus. It’s one of the food staples in Israel, and a large part of their cultural heritage. In fact, chickpeas and fava beans have been a staple of the Israeli diet for over 10,000 years It’s even seen a blending of influences from both the Arabs and Jews throughout the years. You’ll learn quickly that there are many different varieties of hummus to choose from. You can get it with chickpeas, with ful (mashed fava beans), with tahini sauce, with meat on the top… lots of options! It’s always served with plates of vegetables and pickles on the side. At Hummus Eliyahu (חומוס אליהו), the hummus is served warm, with just some olive oil and chopped parsley on top. If you haven’t eaten it warm before, you absolutely must. You can see Haifa’s Polish and Russian influences in this variation. Here is a recipe for Israeli Hummus if you want to make it at home. All you need are some chickpeas, tahini, lemon and salt. You’ve likely had falafel before. I’ve even made it at home a few times, from scratch. I love them. They’re both crispy and fluffy. The perfect thing to stuff inside a pita with some veggies and have for lunch. However, it’s likely you’ve never tried green falafel, which contain three different types of aromatic herbs, dill, parsley and mint, as well as over seven different spices. They’re called green falafel because of these additions, and because of the bright green appearance when you break them open. This is the type of falafel we had at Falafel HaWadi Mishel (פלאפל הואדי מישל) on our walking tour. In Haifa, there is a debate going on which is the best falafel in town, and many people swear by Falafel HaWadi Mishel’s green falafel. You’ll see why when you taste them. First, though, you can watch them making the falafel fresh and fried right in front of you at the counter. Here, the falafel comes out on a plate, all crispy and smelling like heaven, surrounded by fresh veggies and pita, so you can make your own little pockets of goodness. Where ever falafel originated, and where in Haifa is the best place to get them is a distant thought when you’re tucking into one. They are so delicious and hearty. Here is a recipe for Green Falafel if you want to try to make it at home. I like to hydrate dried chickpeas and then peel them for the best consistency. You can form the balls easily with your hands. While Baklava isn’t only found in Israel, but throughout the Arab world, it is a treat that many people, both Jews and Arabs, love and eat daily here. There are many different types of baklava, which is a flaky pastry layered with a honey syrup, nuts and spices, then baked until gooey and delicious. Here is a recipe for baklava, if you want to try your hand at it, although it might be a little too complicated to perfect at home. 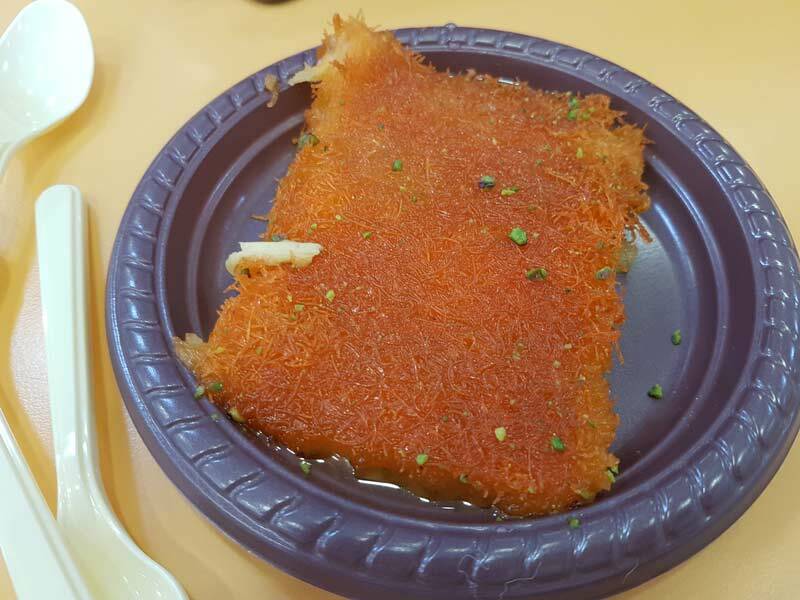 Another treat often found here is Knafeh, which is a cheese-filled pastry, tinted with red food coloring to give it a strangely Halloweenish appearance, then soaked in a sweet syrup and cooked. Pistachio nuts are often spread over the top of the pastry when served. In case you’re wondering, it’s just as sweet and rich as Baklava, but with the added joy of melted cheese baked in. Here is a truly sinful recipe for Knafeh you can try at home. Both of these sweets, plus many others, like Sesame Candy, were served to us at Bakery Of the East (קונדיטוריה המזרח) on the tour. When you walk in the door of this bakery, the sights and smells draw you in. If you love sweets, it’s a place you might lose yourself in for hours. The final stop on our Haifa food tour was at one of the only craft brew pubs in Haifa. Jessica explained that while the craft beer movement is beginning to take off in Israel, it hasn’t reached a large following just yet in Haifa. The brewery we visited, Libira (ליבירה), also serves food, alongside their five beers, in a very modern-looking establishment in the center of town. The place feels like you’ve just stepped into an American brew pub. The five varieties of beer are conveniently displayed and explained on the wall as you walk in, so you know exactly what you’re getting. They have a bitter ale, a Belgian ale, a smoked stout, a double pils and a Weissbier. 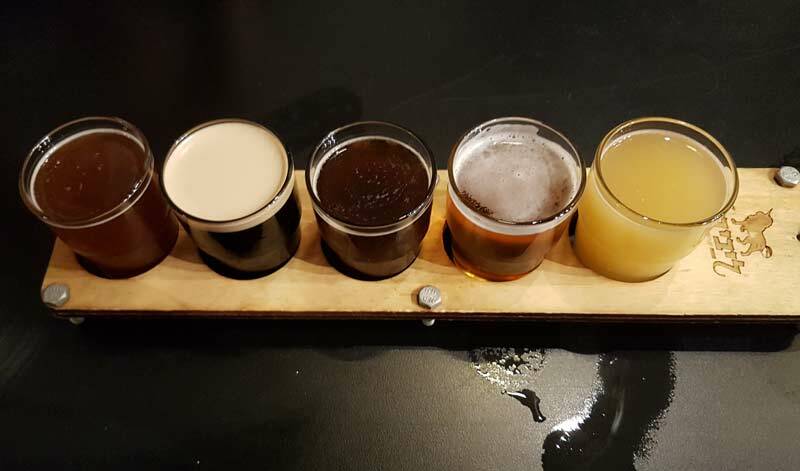 You can even try a sampler tray of all five, if you want. If you want to learn about Israeli food, don’t hesitate to make this trip up to Haifa. I know you might be thinking that traveling in Israel isn’t safe and it would be dangerous to go there, but that is absolutely incorrect, and dated thinking for 2017. Israel (especially the city of Haifa, and the towns of Galilee in the north) are very safe to travel around. You won’t regret the experience! To set up a private Haifa walking tour, contact Jessica at Haifa Street Food Tours. There is a booking button at the top of the website. 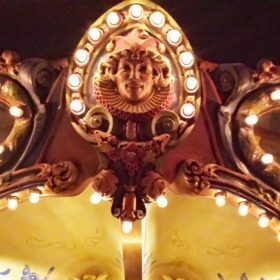 Tours currently cost $90 per person for a group of 2-3 and $85 per person for groups of 4-6 (subject to change). If you do plan a trip to Haifa, one of the best places to stay in a the Dan Panorama Hotel. The view from the rooms is incredible. It’s perched at the top of the mountain, overlooking Haifa, and just a few steps away from the top attraction in the city, the Bahai Gardens. Read reviews on Trip Advisor or book your hotel directly through Expedia.com. This entry was posted in Food and tagged food tour, Israel. Wow! Wasn’t it yummy! You just made me hungry for this food again! Thanks Ajay. And ME TOO! written beautifully. and the pictures are lovely. I know I’d love all those foods, hopefully one day I’ll get to visit and try them. I loved the food of some nearby countries I have visited, which has a lot in common with the food of Israel, and I know from many friends that Israelis are a food-loving nation! Glad you liked it! I agree, they do vegetarian really well. I hear ya, Sherianne. I make it at home because of that. It’s not as great as Israel, but it’s better than I find most places. Israeli food is so great! I love the hummus, the bourekas and that dessert too!! 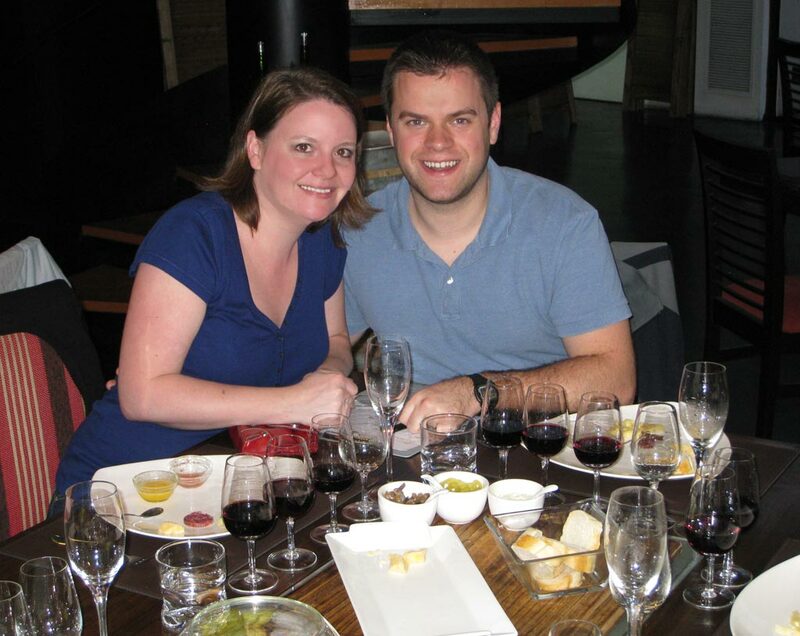 Food tours have become such a favorite of mine to do while traveling! They are not only great to see the city but to get really great, authentic foods! These all look simply scrumptious! The Boreska reminds of of a food I had in Bulgaria (Bonitsa) I wonder if they are similar because the Bonitsa was AMAZING! I consume massive quantities of hummus in North America & would love to try it in Israel. The food sounds incredible. Thanks for the baklava recipe – I have made it once & am keen to try it again. Nancy, it’s great to hear that you’ve tried making baklava. It’s not the easiest to make, but it’s so tasty! Israel is indeed a mystical place with a rich culture and heritage. As always cuisine of a place is a mirror to its history, culture, and people. I loved reading about the Israeli cuisine. The pastries sound enticing and the Hummus looks irresistible. I still think about that hummus! Not a foodie but love falafels. Falafel HaWadi Mishel’s green falafel looks tempting and would love to try Knefah. Israel is definitely on our list to visit this year. Thanks for sharing some cool Israeli cuisines. Well, you certainly don’t have to be a foodie to appreciate great food! I hope you are able to make it to Israel. Mhm great post – brings back so many good memories! I really miss the bourkeas and the crisp green falafels! Doesn’t it? I still think about those crispy green falafels too. I am here in Tel Aviv! Hit me up if you’re around. Been living here for several months now. Knefa is one of my faves! I know! I wish I’d had time to meet up with you while I was there. It was such a rushed trip, getting from one place to the other. Haifa is my favorite city in Israel and it is true you cannot go far without passing by one of these small cafes or street stall vendors with the falafel, hummus, or other yummies. It is a great city, Deborah. Certainly more people need to know about it.